This morning, Felicia and I attended our 1st "Meet The Parents" session at Elkan’s school. Anyway, I was mentally prepared for todáy’s meeting. I was expecting a session of negative comments and unconstructive feedback about my ultra-playful kid. And I told myself that this is a stupid formality…I should just attend and forget about those negative stuffs. In fact, Elkan performed very well in his class. The teacher sang lots of praises of him in many areas – master of languages, motor-skills and maths. However, this is not the main focus of our session today. For me, it was a very emotional meeting. The teacher showed us a piece of drawing which Elkan drew recently. 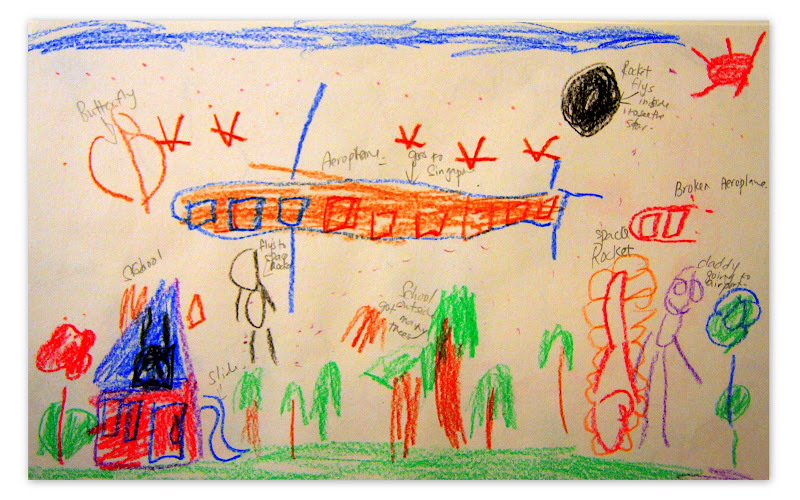 (see photo above) She saw an aeroplane, a house and some people in his drawing. She asked Elkan to explain the story in his drawing. In his narration, Elkan recited to his teacher how much he missed his poipoi and family… and mentioned about those times when Daddy was flying away for work. 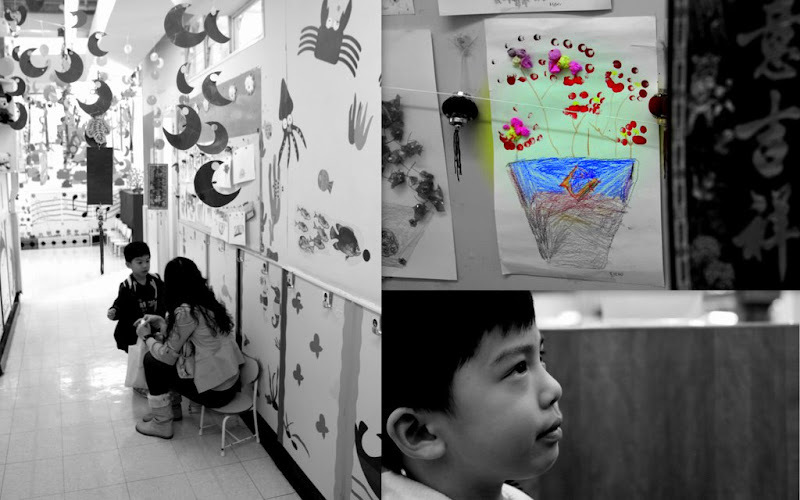 From his own words, his teacher was moved by those feelings Elkan expressed. In Elkan’s mind, Daddy is always flying away… all his favourite aunties, uncles, friends and poipoi were far away…always an aeroplane-ride away. Elkan is only 4 yet his drawing attracted his teacher’s attention so much that she put this as the main topic in our session today. She wanted Felicia and I to know that Elkan is a boy of deep emotions and feelings – and every time Elkan came back from a family trip, he behaved differently. She can feel him suppressing his emotions inside and there were short moments of rebel and rejection. "At this very young age, your boy has been through quite a bit. He has a lot of feelings and he needs lots of love and comfort, I can see how much he loves and misses his family… Especially his poipoi." The teacher showed us those notes that she wrote on his drawing. And when she was going thru each element in his drawing, my heart cried so bady. In fact, my eyes were wet. I can understand Elkan’s feelings. My boy was just like me. Always concealing our feelings with lots of acts and pranks. Yet inside, we are very sentimental souls. At that moment, I just don’t know where to focus my teary eyes. Avoiding the teacher’s eyes, I looked down at his drawing. I, the usual chatty advertising salesman – choked and remained very very speechless today. I hate such session. But I do love my boy so so much.